'How do you get the first post to stand upright?' asked Ibil. 'Anlamiyorum,' quoth I. I haven't a clue. We were helping a neighbour (Ibil was another of my neighbours). The plan was to tall wooden posts to stand upright, and then thatch a roof on top to keep their straw dry in the winter. The posts were trunks of medium sized trees from their coppice. The rain will run off the sides of a well made rick, but in recent years the rick had been blown about so much by the wind that the rain got in and spoiled the straw. A permanent roof would be much better, and we'd use woven willow branches with the straw to make a sound roof. The previous day I'd been with another neighbour carrying firewood to Isil's father. He was about 73 years young, I think, and his knees had worn out. What brought on this reminiscence, I wonder: Listening to people talk, and the bloody news on the radio. There's a breath of fresh air in British politics, with Jeremy Corbyn provoking a rethink of what the 'Labour' party might actually stand for, post Tony B-liar. But the naive view that building more council houses will 'help the working class' is naive and one-sided in the extreme. The British housing market is riddled with many wealthy people / dynasties / corporations / banks that buy up 'property' (they never call them homes) to ensnare tenants for life. This inflates house prices and the cost of building plots. The rents on private accommodation are extortionate, and it's hardly surprising that people with subsidised rents in council houses AND housing benefit feel little incentive to try to save a deposit on a home of their own. A typical worst example being Mr Creepy (not his real name - just what every one calls him!). Mr Creepy was very proud of the fact that he never paid any rent or council tax in 25 years in his council house. He did buy a new car every three years (after about 6,000 miles) to keep his savings below the rent rebate threshold. In other words, he chose to subsidise the car industry instead. The political right would like to believe that a) all tenants are like this, and , b) it is due to their moral failure. Well they aren't all like this, and the system clearly engineers such a change of character. Once a few have 'adapted', their peers feel they are 'mugs' if they pay their way. 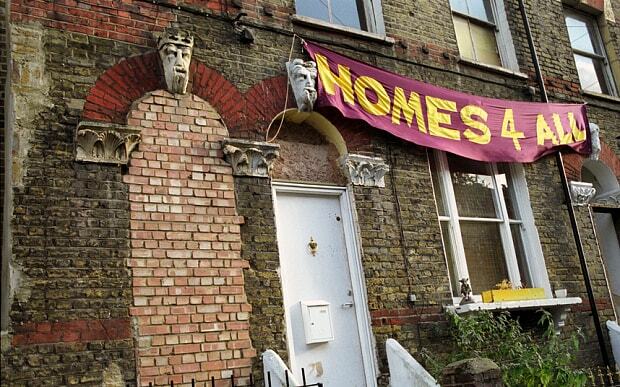 This is anti-social engineering, and it leads in the worst cases to anti-social housing, rather than social housing. Where able-bodied, and able-minded people aren't able to buy or make their own homes, and are further restricted from taking responsibility for their council/social housing, they develop the habit of phoning mother (the council) when anything needs doing, and they become in effect disabled. They have learned to be helpless. On a good day (empathic!) I think of such people as victims of the inept system. if the state cares for people from the cradle to the grave, some will end up on their death bed still wearing a nappy. What can young people do today? A couple without children, both reasonably well paid, still manage to buy their homes. For everyone else - it is a sin for the wealthy re-creators of slavery to monopolise the ownership of 'property' - maybe it should be called improperty? It would (and did, for me) feel inept, and well nigh immoral to remain a victim of their plans. What would I do? Buy a van and convert it to a camper. Work all hours until I saved a quarter of a house deposit, and buy one with 3 like-minded anti-slavery, unplugged, bona fide individuals. Imagine: paying one quarter of a mortgage instead of a full inflated rent. Once you are on the housing ladder, more options become available. A ~socialist government that based it's policy on evidence rather than fantasy/principle would support such freedoms. Once again...in my lighthearted,optimistic way..I must say that things will continue to stay on the doomed course they are currently on. The planet and what is called modern civilization isn't equipped to handle billions of people (the herd). In the end there will be small group of men with fat wallets sitting on a smoking cinder that was once a vibrant planet. ~~~~ Yours truly, Herd member 456,009,482.